By that I mean invisible to us today. 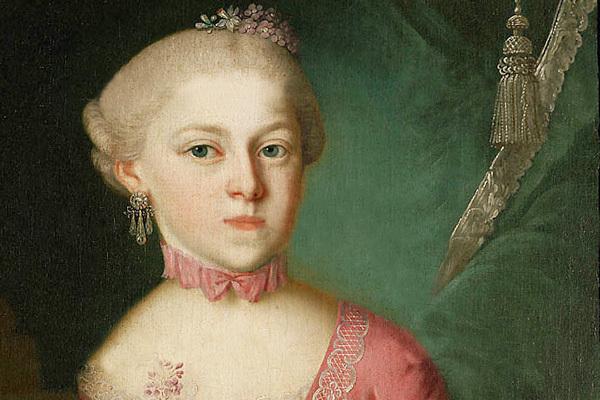 Crowned heads of Europe saw plenty of Maria Anna Mozart, called “Nannerl” by her brother, when the two toured in the 1760s. Papa Leopold mainly wanted to put his elementary-school-age genius on display, but he took both to Vienna and Paris. Nannerl, who was five-and-a-half-years older, sometimes got top billing in harpsichord and fortepiano recitals. Wolfgang later praised her songs in his letters, but none of her music remains for us to judge. When she reached the marriageable age of 18, Leopold “retired” her from performing. He frustrated her romance with a military captain; she then ran her parents’ household, especially after her mother’s death, and remained unwed until she married a magistrate at 32. In the midst of Women’s History Month, I’ve been thinking about Nannerl, Fanny Mendelssohn, Clara Schumann, Alma Mahler and Amy Beach. All five were talented pianists who showed promise as composers but were overshadowed or suppressed by two brothers and three husbands, respectively. Four left memorable work behind: Mendelssohn a piano trio, Schumann a concerto and trio, Mahler a group of songs, Beach a symphony, piano concerto and chamber music. I can think of only one woman allowed to compose freely all her life before 1950. Lili Boulanger’s father died when she was 7, and nobody pressured her to marry. She had no brother to grab attention away from her. Elder sister Nadia, herself a composer and teacher, supported her financially and psychologically. Lili Boulanger remains my candidate for the greatest female composer. She was the first woman to win the Prix de Rome for music, writing the cantata “Faust et Hélène.” Her settings of Psalms 24, 129 and especially 130 (“Out of the Depths”) have beauty and innovative touches. “D’un soir triste,” written in the last year of World War I with her native France in turmoil, is among the most profoundly melancholy pieces you’ll hear. But tuberculosis killed her at 24 in 1918, so we’ll never know what she might’ve done. And isn’t that true of all these women? Ruth Erickson, my first college music teacher, regretfully noted no female composer has left a large body of first-rate work. Perhaps that’s because they weren’t the equals of Wolfgang Mozart or Gustav Mahler. Or perhaps it’s because none were encouraged to find out if they could be.